The latest GSD charts data is in - which contains physical and retail sales for the EMEA region - and it features the impact of the Steam Sale. The PC summer sales event is finished now, and saw big discounts on numerous PC titles. The result is that six of the Top Ten digital games last week were PC titles (and 18 of the Top 25). GTA V on PC was the No.1 download game of the week - rising 131 spaces. Other key PC winners were The Division - up 923 spaces to No.5, Just Cause 3 is at No.6 - up 1,868 places, Dark Souls III at No.7 - up 1,105 positions, and Tom Clancy's Rainbow Six Siege is at No.8 - up a 739 spots. The biggest riser in the Top Ten is Tomb Raider at No.9, up a huge 2,680 places. We could do this all day, and it just shows how significant the Steam sale can be on a chart. Upon saying that, the No.2 download game of the week was The Crew 2 on PS4, No.3 was FIFA 18 on PS4, with Crash Bandicoot N.Sane Trilogy on Xbox One coming in at No.4. Over in the physical charts, things look noticeably different. Although PC may have dominated the digital world this week, Nintendo dominated the physical one. It's important to note that Nintendo Switch games are not included in the download charts as Nintendo does not allow the sharing of digital data. Although it is believed Switch digital game sales are smaller than other platforms (due to the machine's target audience and small hard-drive space), we cannot currently draw any real conclusions on the strength of the Switch in the digital space. Unlike digital, the physical charts currently do not include every EMEA territory due to existing chart deals with other companies. This includes the UK, although the EMEA charts will include UK physical data from January next year. Crash Bandicoot N.Sane Trilogy on Switch was the No.1 best-selling boxed game last week across EMEA. In the UK, although it was close, it was the Xbox One version that was No.1 - beating the Switch version by 250 copies. Meanwhile, across EMEA, the Xbox One boxed version only makes No.9. 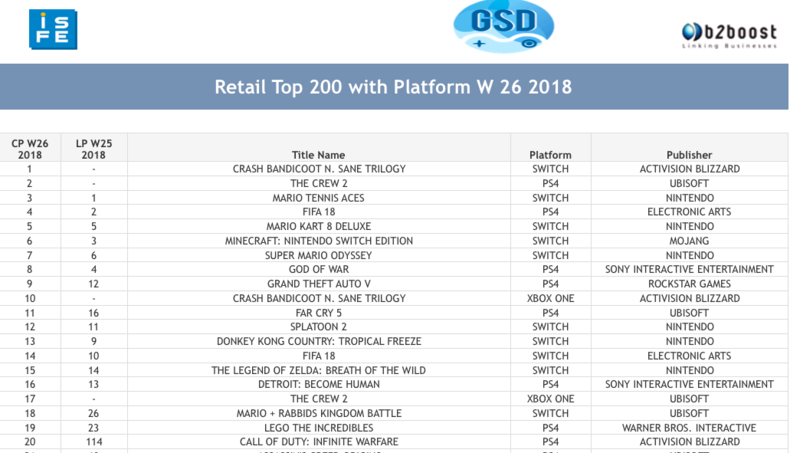 Even when you include Xbox's digital sales (again, Nintendo does not share digital sales), Crash Bandicoot on Switch still reached No.3, while on Xbox One it was at No.6. So Switch had the best-selling version by a large margin, even though not all Switch sales are counted. Out of the Top 20 boxed games across EMEA, 10 were Nintendo Switch games. Mario Tennis Aces is at No.3 (just behind The Crew 2), having been No.1 last week. Mario Kart 8 Deluxe is No.5, while Minecraft: Switch Edition is at No.6, dropping three places week-on-week after its initial launch. 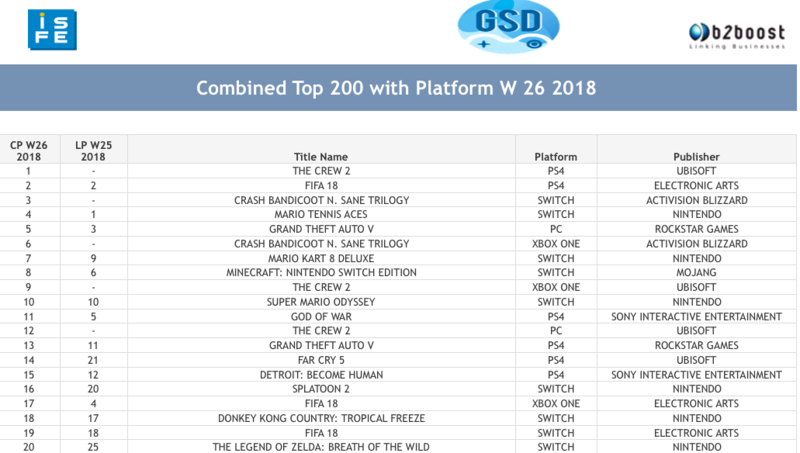 Eight of the Top 20 were PS4 titles, while Xbox One accounted for just two of the best-selling physical games last week (The Crew 2 and Crash Bandicoot making the list for Microsoft's machine). Xbox has struggled for momentum across numerous EMEA territories this generation, whereas the console has been comparatively stronger in the UK and US (remember, UK physical sales are missing). So what does it all look like when all the data (including platforms) is combined as one? Well, the overall winner was The Crew 2. It was the No.1 best-selling game of the week. 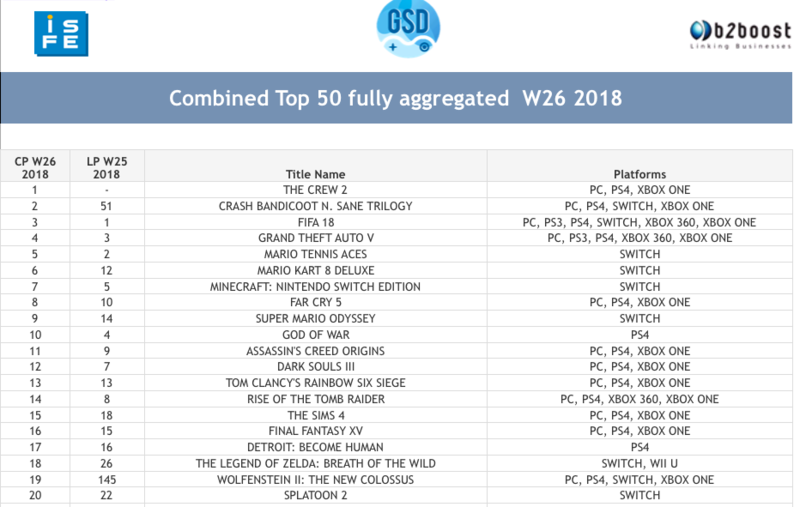 Crash had to settle for No.2, although the Switch version's digital sales are missing from those numbers. FIFA 18, a regular presence in the EMEA charts this summer due to the World Cup, drops from No.1 to No.3. It's interesting to see that despite the Steam Sale, the combined chart isn't radically different. Switch still dominates the Top Ten with four games, even though Nintendo data is missing. 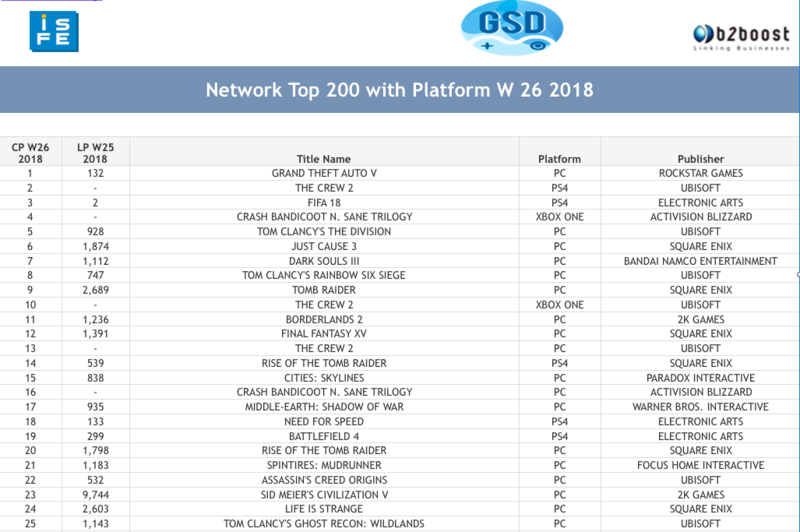 In fact, when you look at individual platforms (so the platforms are separated, but the digital and physical sales are combined), the only Steam Sale game to make the Top 20 was GTA V at No.5. The only other PC game in the 20 was The Crew 2 at No.12. There's only so much analysis that can be made here, however. Retail data only includes some markets (see list below), while the digital data only includes certain games (see list below)... titles such as PUBG are not currently counted. Of course, it is also important to note that the GSD chart is still a work in progress. Not all digital figures are in here as only a selection of publishers share numbers with the chart (physical figures come directly from the retailers, so that isn't an issue). Although most of the big companies are included in the digital figures, as mentioned before, Switch digital sales are not counted, nor are games from Bethesda. Also companies that release occasional big games are missing - such as Frontier, which has just released the hit park simulator Jurassic World Evolution.